Listen to the companion podcast episode. Don't be shy or self-conscious. When I was in middle school, I decided to try my hand at writing a book. My mom saw the pages, picked them up, and read them. She didn't say anything about them, or do anything to make me feel embarrassed (in fact, my parents always praised my writing) but I was still mortified that someone had read my fiction. There was something about writing fiction that made me feel vulnerable in a way that writing essays or humorous pieces didn't. 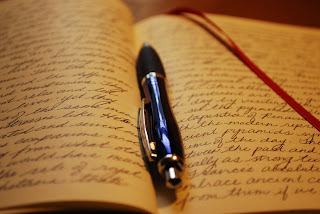 It was a long time before I wrote fiction again. I regret the years I wasted. I probably wouldn't have produced anything publishable during those years, but I've had gained experience and had fun in the process. And who knows? Maybe I would have produced something awesome. Don't focus on getting published. When I taught middle school, one of the most awkward positions I found myself in was when a young writer would tell me, "I wrote my book and had it checked for mistakes. Now, how do I get published?" I never wanted to say anything that would discourage a young writer, but I also didn't want to lead them into a situation where their writing would be dismissed (or worse) by editors (or readers, in the case of self-publishing.) The first books you write aren't going to be publishable, and certainly not a first draft that's been checked for typos. Take pride in what you've written, share it with people close to you, learn the writing and revision process, keep writing new books, and read. Don't be in such a hurry to publish, and don't feel like you haven't accomplished something just because you did not seek publication for a given book. Learn a lot. You can find a wealth of information on writing and publishing for free on the web: blogs, websites, forums, podcasts, YouTube. Heck, Brandon Sanderson offers some of his graduate level writing courses in their entirety for free on YouTube. The writing life is a long journey, one you never complete, so learn all you can along the way. Read a lot! Read books in genres you love. Read books in genres you're not sure you will enjoy. Read non-fiction (you'd be surprised how many story and character ideas you'll get from non-fiction.) Learn from "classic" books but read what's current, too. And don't read the same things over and over. Write a lot! Write short stories, write books, write fan fiction. Practice, practice, practice. Have fun! Enjoy creating characters and stories. There will be plenty of time later on for harsh criticism. While you're young, just create and have a blast doing it.